The key to harvesting spinach leaves is picking the leaves from the outside of the plant, and allowing the centers to grow larger. This keeps the plants healthy so they are able to keep producing more leaves. If you want baby spinach leaves, you can harvest them when they are around 2 inches long. Generally speaking, baby spinach is great eaten raw or sauteed gently because it is so tender. 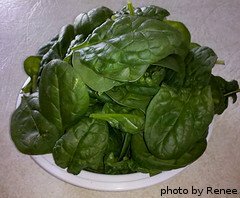 If you plan to cook spinach, or can it or freeze it, you'll get better yields if you wait until the leaves are larger - 4 inches long or more. 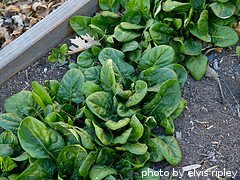 Some spinach leaves will reach 6 inches long or more, depending on the variety. When harvesting spinach, you can usually pinch off the leaves at the stems with a fingernail. You can also use kitchen shears or scissors to harvest the leaves. Just make sure to get the whole leaf and a little bit of the stem. If you break off a leaf without the stem, it will go bad pretty quickly. In the spring, when the days get longer and the weather gets warmer, the plants will start to bolt. Bolting is when they begin to send up a seed stalk and eventually flower. If you allow this happen, the leaves will become bitter and virtually inedible. When mature plants grow taller in a short period of time, it is a sign that a seed stalk is coming. At this point, pull up the entire plant and harvest all the leaves. 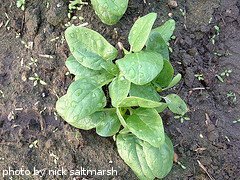 In the fall, mature spinach plants will hold up well to a good frost. When temperatures look like they will drop below 30 degrees F at night, we go ahead and pull out the plants and harvest all the leaves we can get. After harvesting spinach, if you don't want to use it right away, store the whole unwashed leaves in a perforated bag in the refrigerator. They will last 2 weeks, sometimes more if they stay dry. For long term storage, we prefer freezing spinach. Wash the leaves to remove any dirt or grit. Then blanch them by plunging them into boiling water for 1 minute. Then take them out and plunge them into an ice water bath to cool off. This will help them retain their bright green color. When the spinach leaves are cool, drain them briefly on paper towels. Then gather a bunch of leaves together and form them into a ball - we like ours about the size of a baseball. Squeeze the ball to wring as much water out as possible. Then, wrap the spinach ball in plastic wrap and then place it in an airtight bag and store it in the freezer. You can fit a couple of spinach balls into a 1 gallon-sized bag. The spinach will last for up to a year in the freezer. Spinach can also be canned using a pressure canner. Just follow the USDA guidelines for PSI and processing times. Now that you've harvested a bunch of spinach, it's time for a few recipe ideas.